The most important thing to remember is to have respect for the fish and keep it in the best quality that you can. Firstly when the Carp is caught and removed from the water it should be put straight away on ice or in ice slurry so as to reduce its temperature and to humanly kill it. By reducing the temperature this stops the hystermine levels from rising and therefore reduces the nasty taste which sometimes occurs in carp flesh. Reducing the temperature in this manor causes the fish to draw all the blood from its extremities and place it in its nervous systym along its lateral line. This is the section of fish that we don’t usually eat. Carp is very high in Omega 3 and Omega 6. 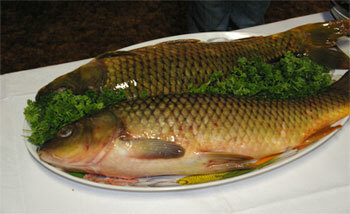 Carp has been used for medicinal purposes with the American Indians for many centuries. The mothers to be would walk many miles to the areas where they could get carp that were ripe with healthy eggs (Roe). They ate this to lower their cholesterol and with the belief to give them a healthier offspring. Carp Roe was steamed and feed the elderly and sick as it was easy to digest and was also considered to be a well balanced food as it is the matter for the start of life.